In modern American history, few sports figures have possessed the mythological aura of young Herschel Walker. At Johnson County High School in Wrightsville, Georgia in the late ’70s, he was a 6-foot-1, 215-pound halfback with 4.2 speed and thighs the size of fire hydrants. While most boys were busy chasing girls, Walker spent his free time tying one end of a 15-foot steel cable to a mud-grip truck tire and the other end around his waist. He would proceed to run dozens of windsprints — 20 yards, 40 yards, 60 yards. "He used to drag me over to the track on Sunday afternoon, our one day off, and we’d pull the tire until I couldn’t pull it no more," said Milt Moorman, a boyhood friend. "But Herschel, he’d be pulling on it till it got slap dark." The notion of trading Herschel Walker terrified many of the Cowboys’ own assistant coaches. There was nothing Walker couldn’t do. He was a straight-A student who ranked first in a graduating class of 108. As a high school senior he rushed for 3,167 yards and 45 touchdowns. In track and field he won three individual events at the Class A state championships (the 100- and 220- dashes and the shot put) and anchored the mile relay team to victory. So enormous was young Herschel that his mother had to purchase extra swaths of fabric to make his three-piece suits fit. Walker’s upper body, wrote Sports Illustrated’s Terry Todd, looked "rather like a dark brown, triangularly shaped nylon sack filled with just the right number of 16-pound shots." After being recruited by more than 100 colleges, Walker attended the University of Georgia, where his legend went national. In 1980 Walker set the NCAA freshman rushing record with 1,616 yards, leading the Bulldogs to an undefeated season and a national championship. "Herschel Walker!" wrote Jim Minter, editor of the Atlanta Journal-Constitution. "Thank God that magnificent young man is not cutting plywood in Johnson County. Thank God for [U.S. Supreme Court Chief Justice] Earl Warren." Two years later Walker wrapped up his collegiate legacy, winning the Heisman Trophy as a junior and deciding — against the wishes of every football fan in the state of Georgia — to turn professional at age 20. He joined the New Jersey Generals of the fledgling United States Football League, where a $1.5 million contract awaited. Walker spent three seasons as the league’s dominant presence, rushing for 2,411 yards, a professional football record, in 1985. But it was here, in an oft-amateurish spring football venture that died after three years, where the first needles were thrust into the Walker balloon. Yes, Herschel Walker was built like Lou Ferrigno, ran like the Flash and put up huge numbers. But he wasn’t really that, ahem, good. "When it came to strength and power, Herschel was your man," says Mark Walen, a Cowboy defensive tackle. "But being a great athlete is about much more than strength and power. Herschel couldn’t dribble a basketball. I mean, he literally couldn’t bounce the ball twice in a row." The USFL folded following its 1985 season, and Walker was assigned to the Cowboys, who had selected him on a whim in the fifth round of the most recent draft. He was immediately pitted against Tony Dorsett, the legendary tailback in his 10th season with the organization. Dorsett resented Walker from the get-go, especially when the Cowboys signed the newcomer to a five-year, $5 million deal. "You had two ball carriers," says Timmy Newsome, a longtime Dallas running back, "neither willing to block for the other." Dorsett, who had moaned about being underpaid for years, finally seemed justified in his complaint. Despite 10,832 career rushing yards and two Super Bowl appearances, he was making only $450,000. On the day after Walker’s introductory press conference, Dorsett held his own to gripe about a lack of respect from the organization. "That’s how pissed off Tony was," says Bob Ackles, the team’s director of player personnel. "Tony’s pride was bruised." 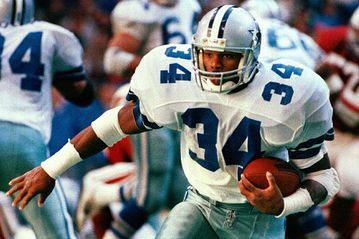 Though Walker played well for the Cowboys, gaining 3,142 yards from 1986–88 and prompting Dorsett’s trade to Denver in 1988, he never quite fit in. His long-term goal was not the Pro Football Hall of Fame, but becoming an FBI agent. His interests ranged from bobsledding to karate to ballet — Walker studied dance in college and, in 1988, performed with the Fort Worth Ballet’s Maria Terezia Balogh. Walker was strange. Quirky. A word-search puzzle addict. "My problem is I have never let people get to know me," Walker said. "I have never said I was Superman. I don’t brag. I just answer questions." Todd Fowler, a Cowboys running back who played against Walker in the USFL and roomed with him for three training camps in Dallas, recalls a warm, soft-spoken man who "probably still has the first dollar bill he ever earned. "Herschel only ate one meal a day," says Fowler. "At breakfast and lunch he’d drink juice and stuff. After we’d get out of meetings, he and I would go to Carl’s Jr. He’d get a double burger and fries. That’s all he’d eat the entire day. Plus, he only slept four hours per night. You’d get up to piss at 2 a.m. and Herschel would be in the living room reading his Bible or doing push-ups or sit-ups." This entry was posted in Dallas and tagged boyhood friend, grip truck, herschel walker, Jeff Pearlman, three piece suits, wrightsville georgia. Bookmark the permalink.